I have seen the future of Colorado, and it does not include me as Governor. 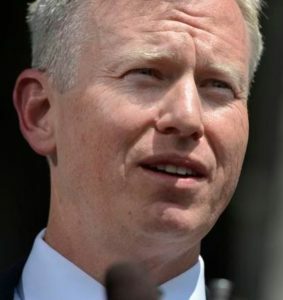 George Brauchler, the 18th Judicial District Attorney, has decided to drop his candidacy for the Republican nomination for Governor of Colorado for 2018. He first announced his decision to run last April. Instead, Brauchler will campaign for Attorney General. Brauchler is absolutely committed to getting elected to some sort of statewide office. It appears as though he won’t have to navigate through a crowded primary in a race for Attorney General — both Rep. Ken Buck (R-Greeley) and state Rep. Cole Wist are backing off — but Brauchler has a long way to go to catch up to Democrats like Phil Weiser and Michael Dougherty in the AG’s race. Two years ago, Brauchler resisted a courtship from Republicans to be their default U.S. Senate candidate. After the 2016 election, Brauchler moved quickly to build support for a bid for Governor, officially launching his campaign in early April. But Brauchler’s gubernatorial bid never really took off; he had been limping along for months, and when he failed to even raise $100k in the Q3 fundraising period, the narrative of a campaign on life support began to take hold. Tom Tancredo’s subsequent entry into the race closed off whatever path to the GOP nomination Brauchler might have had left, and Attorney General Cynthia Coffman’s decision to run for Governor rather than re-election gave Brauchler the opening he needed to exit a race he couldn’t possibly win. Attorney General is probably the statewide office that always made the most sense for Brauchler, but as he enters the race today, it is with the air of a man seeking a consolation prize. This is nothing but Republicans lining up for victory in 2018. Brauchler will be AG, and I predict he'll be governor someday too. Cynthia Coffman will win. Colorado Pols and Democrats will be crying into their Cheerios the morning after election day. You're a sad, deluded little man. Still, being paid by the post, as you are, this one is surely worth at least a couple of rubles. Or is it Koch Bucks? Or both? I know. Dems are really crying into their cheerios after what happened in Virginia, New Jersey and Washington State last week. What is your take on those elections nutlid? And if anything, CO is even bluer than VA, where the gop was thoroughly routed and quite nearly slaughtered last week. Hell, a Dem is running even in Alabama today. It does, but if I remember my physics, that's like adding a negative number, or contending with the force of gravity pulling back to starting point zero. Brauchler looks like he part of the Bronco's coaching staff (clueless about how to contend). … What, no broccoli emoji?! Brauchler 2017: Will run for food! Brauchler 2018: Please vote for me for _____________ (fill in the blank with any office I can win). I promise I won't tweet in the courtroom anymore. Pinky swear.